Oboe with Piano Accompaniment. Composed by Michael Head (1900-1976). Boosey & Hawkes Chamber Music. Contemporary, Classical. 8 pages. Boosey & Hawkes #M060032295. 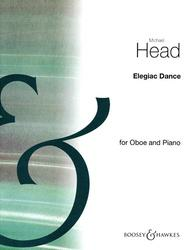 Published by Boosey & Hawkes (HL.48009819). Movement Two from Three Pieces: Gavotte, Elegiac Dance, Presto.